Every family has its own set of traditions. Some are observed at specific times, holidays, birthdays, anniversaries. And then there are those which are kind of floaters, not tied to any specific point on the calendar. The one thing most have in common is that they’ve endured for generations. 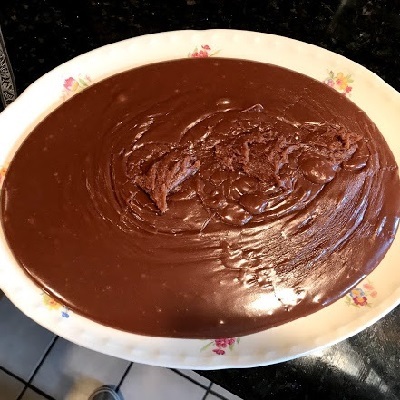 One of those floating traditions that was observed in the Robert Romick branch of our family (and perhaps others as well, but since this is a floating tradition, I’m not sure) was the making of fudge, Pap’s Fudge. Though that Dad, the Pap, was not the originator of this particular fudge. The legend is that his grandmother Romick was the one who passed the recipe down. That means that at least 6 generations of Romicks have feasted on this fudge, a peanut butter variety. Somehow my son Caleb got his hands on the recipe and has made it at least once. So far my only time to make the fudge was the day before Dad’s funeral, Tuesday, October 10, 2017. 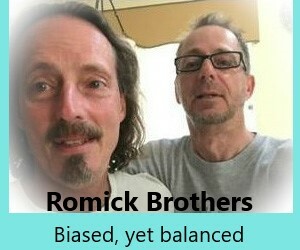 My brother Mike and I made two batches for the viewing at the funeral home. This is a simple recipe, but not easy. Our first batch came out nearly perfect. The second was edible, but the consistency was just a tad off. We didn’t let that bother us though. There were times when Dad made it and it never solidified, so that fact that both of our batches were actually solid was a win. 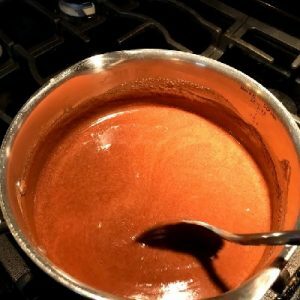 I’ve shared three photos of this process, one is the fudge cooking in the pan, the second is that nearly perfect first batch. 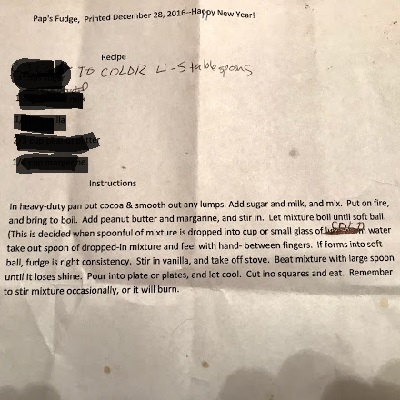 The third is a highly redacted photo of Dad’s recipe. It is a tightly guarded family secret, so I’ve hidden the actual ingredients. Above is a video I shot of us making the fudge that morning.